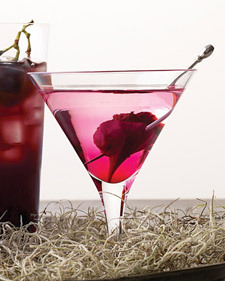 halloween party drinks | food. shoes. booze. I agree with my friend’s Hump Day Happy Hour Posts so much I’m stealing them. And I’m starting off with Martinis because I love how a woman looks holding a Martini glass. Directions: Chill 4 martini glasses in the freezer or fill with ice water and let sit until frosty, about 5 minutes (pour out water). Add the vermouth, dividing evenly; swirl to coat the glasses, then pour out. Add gin to a cocktail shaker filled with ice. Shake vigorously until chilled; divide among chilled glasses. Garnish each with a skewered pickled baby beet, and serve immediately.